Semicolon is not just another free WordPress theme for writers, it stands in a class of its own. Most WordPress themes for online magazines tend to be too busy, packing too much content on the screen. This theme can be described in one word, economic. This theme highlights what’s most important, the content. If you want a minimal theme to feature magazine style articles, this theme will definitely impress. Konstantin Kovshenin, a developer who currently works at Automattic, created this theme. 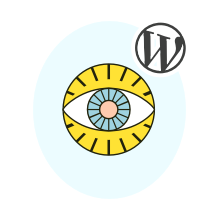 Semicolon is hands down one of the cleanest themes for writer’s to utilize on WordPress. This theme looks sleek, without all the clutter you’d typically expect from a free magazine template. Semicolon is easy to install and maintain. Additionally it looks beautiful on phones tablets and other mobile devices. Regardless of whether you are an advanced WordPress user, or a novice, this theme can help you take your content to the next level. The simple layout and design lets the writing do the talking, so your visitors can focus on your words. Semicolon’s minimal design puts the emphasis on large, easy to read typography. It’s easy to personalize your theme even more by adding a unique background image or changing the background color via the WordPress customizer. Semicolon uses the Jetpack plugin to manage featured posts, so you will need to have this component installed to use this feature. If you have Jetpack you can assign a unique tag for your featured posts through the WordPress customizer. You can also use the customizer to add your own background image, or choose the background color. The admin page is simple and easy to navigate. There you can update an author bio area, and create new profiles for multiple authors. All related posts list will also be shown beneath your content. Semicolon has four regions for widgets. Most WordPress online magazine templates use the widget areas to outline the layout of your main content. This them has 4 widgets, with three located in the sidebar. A blue background highlights the primary widget, which works great for an alert, or any other information you’d like to highlight. The fourth widget is located at the footer, where any widgets you create will be loaded horizontally. Semicolon’s default feature allows you up to three widgets in the footer.